With perfect conditions predicted we left the Port Elizabeth harbour at 7am, an early start in preparation for a long day at sea. 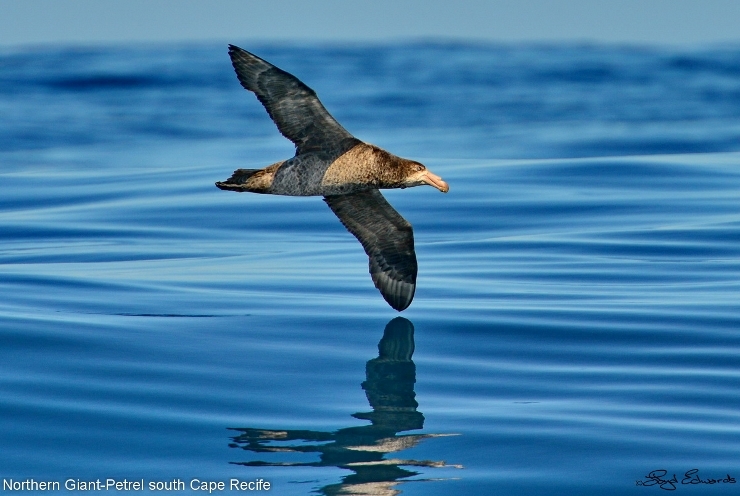 It was our first pelagic seabird cruise of the season and we had a boat full of keen birders from all parts of the Eastern Cape. Our destination was the continental shelf which starts 25 nautical miles (about 50km) south of Cape Recife. Our bird guide was Daniel Danckwerts who came prepared with 20kgs of sardines and some anchovy oil. There was a 3,5 to 4 metre swell running on the Wildside but no wind to speak of. Initially it was slow going with only the odd bird being seen. Once we arrived at the shelf the water was warm and a beautiful blue colour. We started chumming and soon had the attention of White-chinned Petrels. Once one of the birds settled on the water so more started to arrive. They breed in summer on sub-Antarctic islands, travelling vast distances in order to feed their chicks. The petrels are very photogenic running along the surface of the water prior to lift-off. Next to arrive were the Indian yellow-nosed Albatrosses, both juveniles and adults. They breed in colonies in the Southern Indian Ocean notably Prince Edward Island. Then the largest of the Mollymawks, a Shy Albatross arrived on the scene followed by some more of his kind. These birds are a long way from home as they breed on islands off New Zealand and Tasmania. Then out of the south arrived the "catch of the day", a Northern Giant-Petrel. Wow what a sight that turned out to be! At almost a metre in length and weighing almost 6kg this surely is a giant. They feed on carrion, birds, fish squid and crustaceans. A little while later one of the bottles containing the anchovy oil broke away from the boat and while we were trying to retrieve it a Mako shark made its appearance. He seemed very interested in the bottle and its contents and made numerous passes at it. What an unexpected bonus for the cruise. Another bonus were the three humpback whales we spotted just off Cape Recife. Due to the success of the cruise we will be having another one next weekend and try and run them on a regular basis in future.